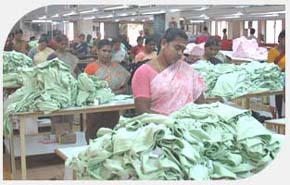 JAANDAR APPARELS was started in the year 1999 by MR. EMPEROR SARAVANAN, a young entrepreneur from Tirupur, JAANDAR APPARELS has grown steadily grown over the years. 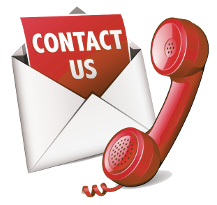 This Success can be mainly attributed to two factors- Quality and Customer satisfaction. JAANDAR APPARELS believes in quality as per individual customer taste and requirements. "Exclusive for Kids Wear and Ladies Wear". 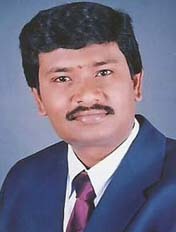 MR. EMPEROR SARAVANAN looks after marketing and production aspects of JAANDAR APPARELS his brothers MR. ARUN and MR. LUKMAAN who is involved in the administration and financial functions of the concern and MR. ARUN & LUKMAAN who looks after In-House production, helps MR. EMPEROR SARAVANAN in functions of JAANDAR APPARELS. After entering the European Market in 1999 we moved across the Atlantic and soon became the major supplier of knitwear items on both sides of Atlantic with our own vertical set up of Infrastructure like sophisticated individuals systems for knitting, compacting, embroidery we are able to specialize in garments manufacturers from we have an efficient administrative vision that is gears to one of the international quality status requirements. Our Knitting division is equipped with advanced Pailung circular knitting machines from Taiwan. We are known for offering a plethora of knitted fabrics in different designs, patterns and textures using the best quality yarns. Our knitting department is set up with imported machines that offer tremendous performance. World class machineries have been imported from Germany (Terrot), South Korea (Keumyung), Singapore (Unitex) and Italy (Orizio). This CIRCULAR KNITTING unit is equipped with knitting machines from Singapore; in addition we have got COLLAR & CUFF making machine from China. Unit contains all sizes of “Dia” machines. 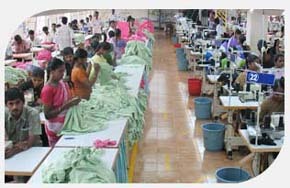 All the Machines are carrying versatile facility with equipment to make any kind of designs in fabrics & Yarn. All the Machines are attached with LYCRA Attachment. 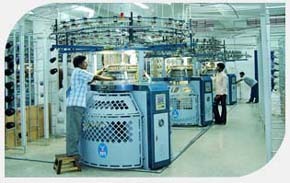 Our wet processing unit comprises the most modern eco-friendly machines such as THIES Soft flow Dyeing machines imported from Germany, SANTEX Padding & Drying machine imported from Switzerland, DATACOLOR Lab Equipment from USA, Compacting machines Tube-tex ( from USA) and Ferraro ( from ITALY) and Brushing and Raising machines. We have a Government approved and fully functional modern individual Effluent Treatment Plant consists of RO unit, Multiple Evaporators and Zero Liquid Discharge Unit. We recycle and reuse the water, maintaining Zero discharge, contributing for the betterment of environment. Highly sophisticated soft flow dyeing machines are used by us that are eco friendly. Tube Tex (USA) machines are used to control fabric shrinkage to the maximum level. Fabric cutting that ensures the desired styles has been perfected with the use of computerized Lectra CAD markers. Our sewing facility sprawls over 4 different units, strategically located in the same vicinity with the combined capacity of 15,000 units/day in fashion styles. Lay cutting machines with automatic spreader that are highly advanced are been installed in our product unit. A separate squad is been appointed to make quality check fabric cut and stitching! To avoid angle variations in shape, we use effective band knife cutting machines. 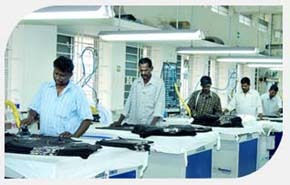 The manufactured garments are checked by our skilled workers. 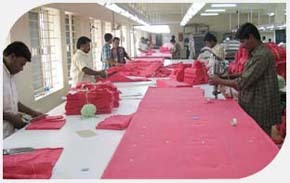 They make sure the quality of the garments is satisfactory and meets the international standards. The verified garments are steam- ironed to make them wrinkle-free and attractive. The packaging unit takes care of the packing process. Here garments are neatly packed with utmost care. Once the packaging is done, the garments are sorted out for shipping. 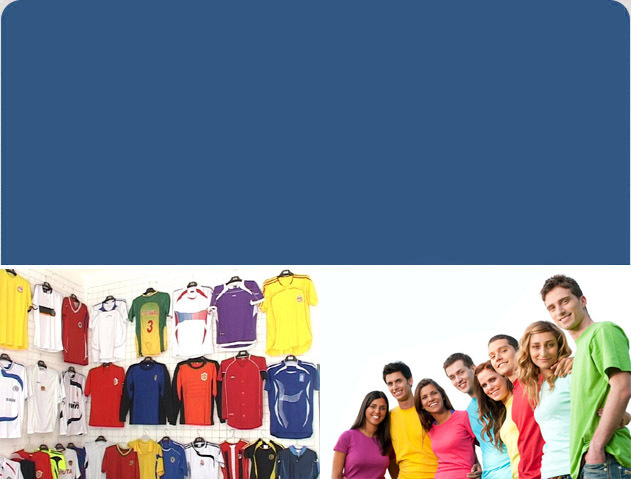 The product range of garment includes Ladies night wear, children's wear, Polo T-shirts, Sports wear and Fancy T-shirts. Our range of products is quite simply exhaustive and showcases the complete collection of Hosiery garments. : T-shirt, Polo Shirts, Jackets Inner wears, Barmudas.